Lately the idea of the United States as the land of opportunity—the place where hard work leads if not to riches then at least to a decent life and the hope for a better future for one’s children—has been challenged. In the new reality, hard work yields diminishing returns, access to quality education is uneven and often unaffordable, and the obstacles to building assets and economic security loom larger for Millennials than they did for their parents. Earnings from wage and salary employment remain the backbone of US household budgets, constituting nearly 80 percent of the income US households rely on. And savings from earnings have played a key role in achieving the dream of owning—whether it’s a house, a business, or other assets. Yet for the past several decades, and despite robust economic growth, earnings for most working people have stagnated, even as the costs of life’s basics—housing, health care, childcare, education, and more—have climbed. As household budgets have been squeezed, so too have opportunities for owning, leaving more Americans feeling left out of and left behind by a booming US economy. This is a situation that bodes ill for the future of democracy. An old idea, however, offers new hope: employee capital shares. Colloquially referred to as “worker ownership,” employee capital share strategies can take many forms. Employees may hold shares as participants in an Employee Stock Ownership Plan. Or be members of a worker cooperative. Or have a meaningful stake in a public company or start-up through a variety of forms of equity participation. Or have a stake in company success through profit-sharing strategies. In the United States the idea is very old, as Joseph Blasi, of Rutgers University, describes in his book The Citizen’s Share. Blasi tracks the use of employee capital shares back to the founding of the country and the cod-fishing industry in New England. The success of the new democracy rested on broad-based property ownership, which would give more citizens a stake in the success of the country. If implemented in an inclusive manner, the appeal of employee capital shares remains strong. A system in which workers share in their company’s success strikes most people as fair—likely to encourage responsibility and hard work and in line with an ethos of entrepreneurship and opportunity for those willing to work for it. 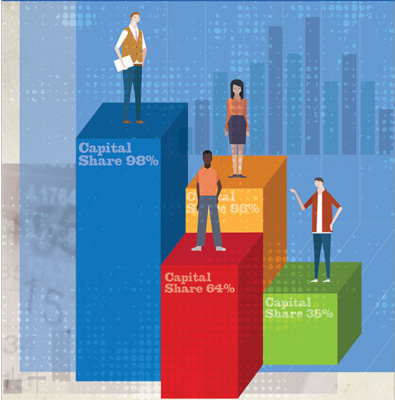 Research has found that certain capital share strategies are associated with better outcomes not only for workers but for businesses and communities, too. For workers, capital share ownership strategies have been positively associated with better wages and benefits, greater employee autonomy and participation at work, higher rates of employee retention, and other indicators of quality jobs. Business performance among firms with capital share strategies has also compared favorably to peer businesses in terms of profitability, and employee-owned companies have shown greater resiliency during economic downturns. For communities, particularly smaller communities, employee ownership has provided a critical strategy for retaining firms and jobs, keeping income and wealth in the community. Today, roughly one in five workers at private companies owns some stock in their employer, and about one-third of workers participate in a profit-sharing plan. Unfortunately, as Blasi and his Rutgers colleague Douglas Kruse point out, the distribution of worker ownership opportunities reflects the same inequality trends as wealth inequality overall. For the top 20 percent of worker-owners, the ownership stake is much more meaningful than for the typical worker-owner: the average value of employee-share wealth among male worker owners is $57,942, but the median is only $13,159. And there are sharp differences across race and gender lines. The average value for white worker-owners is $52,306 compared with $35,062 for African Americans, $29,847 for Hispanic workers, and $39,747 for women. Broadening and deepening employee capital share strategies, and ensuring that such efforts are inclusive, would give more Americans a meaningful stake in the success of the US economy. Policymakers can play a key role in encouraging employee capital share strategies. In fact, Congress took action: in a bipartisan fashion it developed and passed the Mainstreet Employee Ownership Act, legislation that was included in the defense reauthorization bill and signed into law by the president last September. The legislation directs the Small Business Administration to support employee capital share strategies through its outreach and technical assistance, and to provide access to financing for employee-ownership conversions and employee-owned companies. Federal as well as state governments could build on this important step with tax incentives, procurement preferences, and other encouragements for employee capital share strategies. Of course, policymakers cannot advance employee-share ownership strategies on their own. Business leaders, business educators, lenders and investors, and workers themselves all have critical roles to play. But legislators have some key tools to encourage the approach and a bully pulpit to spread the ideas. Take as a given the positive effects that employee-share ownership has been shown to have on business operations and job retention in communities, the quality of jobs within a company, and the ability of working people to build wealth. Then imagine what widespread, inclusive employee-share ownership could mean for the country. That way lies the American Dream.